We had to do a quick study on where to focus geographically/state-wise for one of our products - ideally it shouldn't matter where the user is but we had this constraint to get the stats to focus on 10 states. Obvious start was to look at population stats; more population translates to more users/customer base translates to focus. 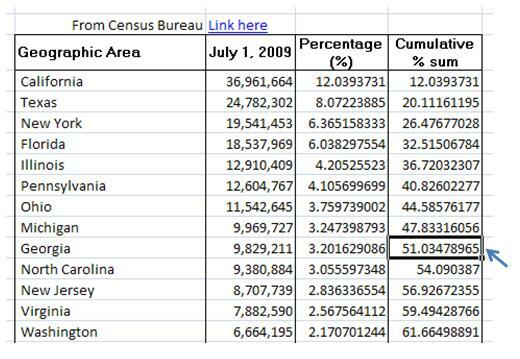 For data source, we used US Census Bureau population projections for each state from year 2000 to year 2009 - available here. As you see in below picture, we added two extra columns along with the sorted list - percentage and cumulative percentage sum. To our surprise, first 9 states constitute more than 50% of whole population in US. I did look at the population spread before but this is definitely a surprise to see 50% of whole US population living in 9 states.